Brrrr. It’s really cold right now in Massachusetts so that means a couple of things; keep the water trickling through the taps to avoid having a $500 plumber bill to replace burst pipes and more importantly some nice quiet, peaceful shooting time. Fortunately Santa knew exactly what to bring me so now I am wearing my bright red Arcteryx jacket which keeps me really warm. Not inconspicuous in the snow! On Dec 30th (is that New Years Eve Eve?) 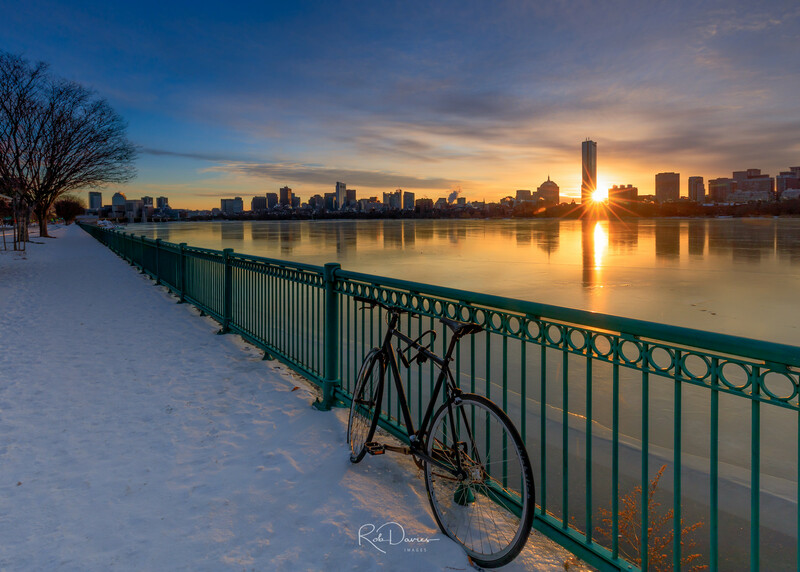 I took a chance on getting the elusive colorful sunrise over Boston from Memorial Drive. I’ve tried many times and got reasonable shots but not spectacular. As sunrise approached I could sense that today would be similar but I was fortunate with a few elements which made for a composition that I was happy with. Thanks to the person who locked his/her bike on the railing. It was about 10F at this point and after an hour outside the only thing causing me discomfort were my fingers. I may need some other gloves which are good for operating the camera. Suggestions would be welcome! In the evening I drove up the coast to Annisquam Lighthouse near Gloucester. I’ve been there on several occasions but never when the ocean was frozen. I wish I had left earlier because I arrived about 45 mins before sunset, just as the sun started to dip below a horizon cloud. The ice on the rocks and the formations were quite something. I was trying to find a pleasing composition. Some areas were also quite deep and slushy so I moved quite cautiously toward the lighthouse. It was so cold I was having some problems with the tripod freezing, but I worked my way through that. Here are a couple of shots from that night. I hope you like them.